Making Christmas dinner for large groups can be so stressful. The tips below may help ease the burden. It’s never too early to begin planning your Christmas food, in my opinion. I love food – both eating it and cooking it – and I love meal Planning in general (as I can think about eating and cooking food!). Lists are my friend. Every area of my life consists of lists because, quite frankly, my memory is terrible and I would be the worst scatterbrain around if I relied simply on my brain. Lists are great for prepping for seasonal hosting – I currently have a shopping list, a recipe list and a table decor list on the go. People hate to rock up empty handed so why not take advantage of that fact and ask your guests to contribute something. A dessert, a cheeseboard, alcohol or even a joint of meat all work well and help you share the cost too. 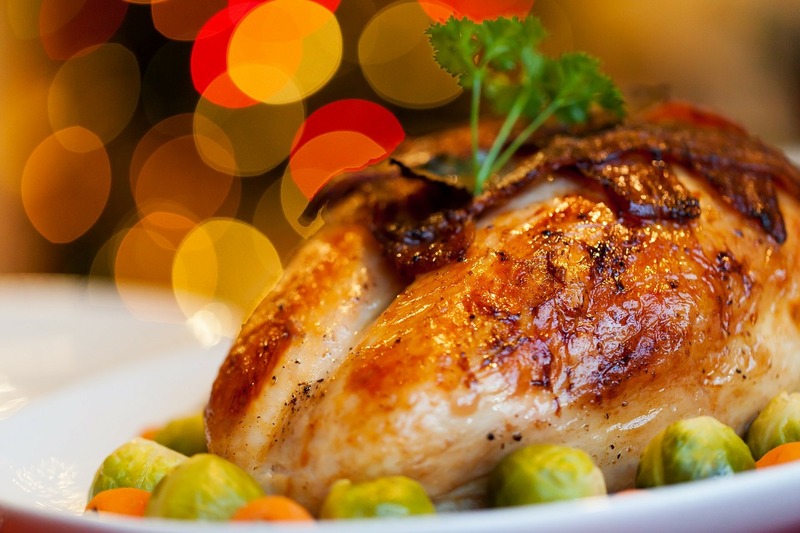 Almost every aspect of Christmas dinner can be made in advance including preparing the veg, stuffing the turkey, preparing sauces and all manner of puddings and baked treats. You can even lay the table the day before. Then all you have to worry about on Christmas morning is shoving it all in the oven (and the monotonous turkey basting!). Leaving you more time to spend with the kids. My favourite phrase is equally relevant here too. Maybe you’re trying to emulate a perfect, trendy table decor you saw on Pinterest or make your roast potatoes as good as your mum’s but don’t bother. It’s a waste of energy to try to make everything flawless. Instead focus on the things you know you do well and on the fact that everyone sitting around the table and spending time together is the most important part of the meal anyway.